The Syro-Malabar Church is the largest of the "Nasrani" (St. Thomas Christians) denominations with over 4 million believers and traces its origins to the evangelistic activity of Thomas the Apostle in the 1st century. Syro-Malabar scholar and theologian Mar Placid Podipara describes the Church as "Catholic by faith, Indian by culture, and East Syriac/Oriental in liturgy." 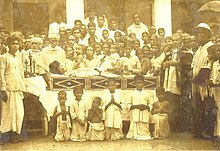 The Syro-Malabar Church members are predominantly of the Malayali ethnic group and speak Malayalam.The members of the Church are colloquially known in Kerala as Marthoma Nasranis and Malankara Nasrani. Following emigration of its members, eparchies have opened up in other parts of India and other countries due to facilitating the Malayali diaspora living in North America, Australia and the United Kingdom. Saint Alphonsa is the Church's first canonized saint, followed by Saint Kuriakose Chavara and Saint Euphrasia. It is one of the two Eastern Catholic churches in India, the other one being the Syro-Malankara Catholic Church which uses the West Syriac Rite.